Lucius, an architect of spa baths for the Roman Empire, inadvertently travels through time and finds himself in a modern Japanese bathhouse. He takes elements of Japanese culture that he is inspired by, and brings it back with him to Rome and becomes hugely successful, which leads the Emperor to command him to build a massive spa. 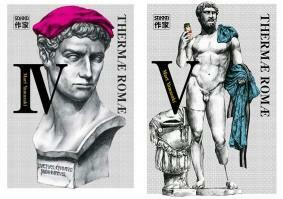 Thermae Romae is based on the adaptation of Mari Yamazaki‘s award winning manga, which has won both the 2010 Manga Taisho and the Tezuka Osamu Cultural Prize for Best Short Work. 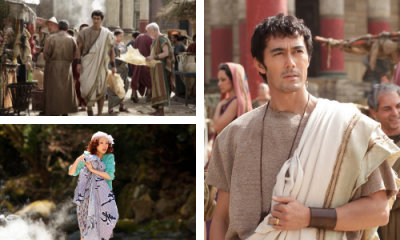 The film features a roster of talented actors who throw themselves into their roles as citizens of ancient Rome, including Japanese heart throb Hiroshi Abe who plays the protagonist Lucius. Another striking aspect of the films production is its large open set built at Cinecitta, Italy’s largest film studio. Mari Yamazaki, manga author together with Stars Aya Ueto and Hiroshi Abe at the premiere of the film at the 2012 Toronto International Film Festival. Despite the change in setting and language and numerous creative liberties, Throne of Blood often is considered one of the better film adaptations of the play. It won two Mainichi Film Awards, including Best Actor for Toshiro Mifune.